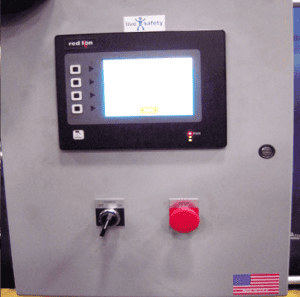 Precision flow control system to test fabrics for hazmat suits, used in military, nuclear, biological, chemical food and pharmaceutical applications. 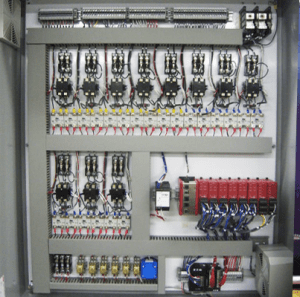 This extreme precision flow control system was designed by Electronic Control Corporation to test fabrics for hazmat suits, used in military, nuclear, biological – chemical, pharmaceutical and other industries where various processes require high performance protection. In this case the electronic control system was to ensure the hazmat fabric met or exceeded specifications. 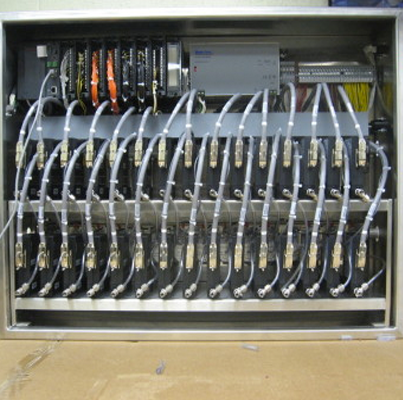 The segmented electronic control valve groups connected up to over thirty testing different stations. These stations were comprised of encapsulated pods for pieces of hazmat fabric. Chemical sniffers on one side of the pod were used to seal in the fabric. Nozzles for the outflow of gas were built on the other side of the fabric pod. Different valve groups would simulate different conditions during a testing period of over three days. This was to simulate the condition of a person having to be in the hazmat suit for extended periods, such as for military field applications. The different valve groups would simulate different geographical climate- and atmospheric conditions. This included combining various conditions and transitioning from one climate to another, such as simulating a transition from a hotter to colder atmospheric temperature. Also to transition out of the jungle and into the arctic. This was to ensure a comprehensive approach was taken. 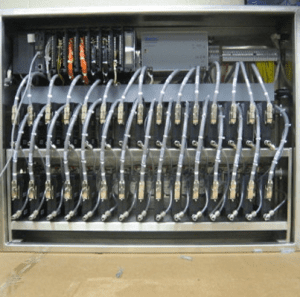 To ensure accuracy and reliability; given the ultra-sensitive conditions ECC ensured all connections were leak-proof and non-corrosive. It was essential that the controls effectively managed air flow and humidity throughout the monitoring and testing process. ECC had to ensure that no gas, used during the tests, leaked out of the electronic control valves. So part of the build out included smoothing burrs on the precision flow control system tubing and utilizing brackets to eliminate motion and resulting risk of leaks during testing. These factors extend the life of the system and ensure maximum up-time for an ecc-automation extreme precision flow control system. Precisely and extremely controlling the amount of gas during hazmat fabric testing required the utilization of two electronic control gas valves, manufactured by Sierra Instruments used together during the test. Electronic control valves were used to throw in various conditional changes and simulated anomalies. Sinister scenarios were tested such as introducing a different nerve agent. 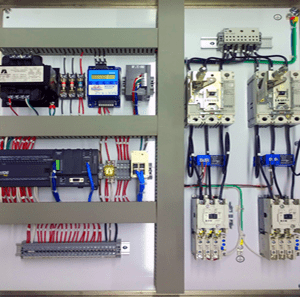 Programmable logic controllers or PLCs, programmed in-house by the Electronic Control Corp. programming team introduced the various interference variables. 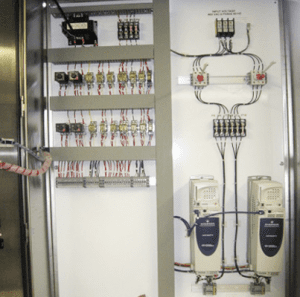 Along with the ability to connect up a laptop for data collection and monitoring, HMIs, such as those manufactured by Horner Automation Group, were installed. These high quality HMIs, with colorful screens, are perfect for electronic control systems that require data monitoring, periodically or in real-time. 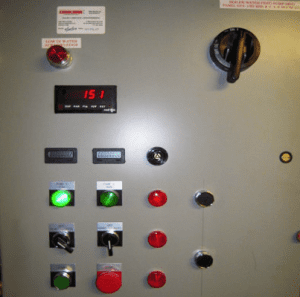 Part of the initial scope included the possibility of building another group of electronic control valves for controlling gases before they entered the main testing system. The client was uncertain at first, if they wanted to go ahead with this additional work. So a prototype was developed early on, that would allow for more seamless integration later on. In the testing fabric used for suits worn by personnel working in potentially- or actual hazardous material situations, obviously there can be no room for error. So the electronic control system designed and built by Electronic Control Corp was implemented with the extreme precision control in mind. What is your extreme precision control challenge?